Do Low Interest Rates Cause Housing Bubbles? You can't really run a controlled experiment to see whether low interest rates cause asset bubbles to develop or not. Consequently, you can't really ever say that one causes the other. That didn't stop countless academics from trying to figure out the relationship between low interest rates and asset bubbles though. So what is the relationship? 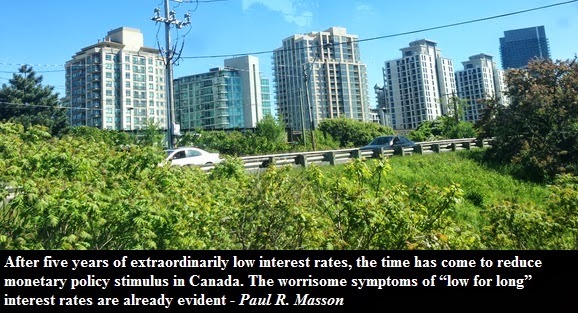 Recently Paul R. Masson, who was a special adviser to Mark Carney, argued in a commentary that short-term interest rates in Canada are too low and that they in turn facilitate asset bubbles. But how does one judge whether interest rates are set too low or too high? Let me introduce you to the Taylor Rule. In the most simple terms, Taylor Rule suggests that for each one-percent increase in inflation, the central bank should increase its nominal interest rate by more than one percent. For example, in 2012 the average inflation in Canada was 1.5%, so according to Taylor Rule, the benchmark interest rate should be at least 1.75% or even 2%. What's essential is that the short term interest rate is set above inflation. The current benchmark rate in Canada is set at 1%. Thus interest rates in Canada are currently "too low. They've been too low for over 4 years! According to Masson, once you have artificially low interest rates it can lead to excessive risk taking and asset bubbles. He specifically points to the housing market in Canada which had experienced a housing boom for over a decade. In his view, the longer the boom lasts, the likelier it will end in tears. As a result of the long period of rising prices, Masson suggests that Canada should preemptively tighten its monetary policy to diminish the ultimate damage from the housing bubble. Masson is not the only one who thinks that low interest rates encourage asset bubbles. Recently Swiss Central Bank published a paper (2012) which examined the relationship between low interest rates and real estate bubbles in 14 OECD countries. The Bank found that when interest rates stay "too low" for "too long", they have have a strong impact on a development of a housing bubbles. "Too low" means that the short term interest rate was below what the Taylor Rule suggests. "Too long" was calculated as a number of consecutive quarters with "too low" rates for each country. A paper by Bahadir and Mykhaylova (2013) found a link between declining world interest rates and housing bubbles in countries with an account deficit. Interestingly, this paper notes that in both the Netherlands and Canada there is a strong link between loose monetary policy and rising real estate prices. Another paper by Merete Myrmo (2012) also came to conclusion that low interest rates facilitated the formation of a housing bubble in the United States. Additionally Myrmo suggests three main risk factors for development of a housing bubble are bad lending standards, low interest rates and steep growth in population. So far it seems that low interest rates tend to facilitate the growth of housing bubbles. Yet it doesn't necessarily mean that low interest rates cause housing bubbles. Also, low interest rates are not necessary for a bubble to develop. Just think of Toronto housing bubble in late '80s. Finally, even if the interest rates are low, that doesn't mean that there is a housing bubble in development. For example, the absence of a housing bubble in Germany.